The server will go live on December 17, but how long will it last? Nostalrius, the fan-run server for World of WarCraft that lets players return to the vanilla, pre-expansion version of the MMORPG, will go back online later this month. According to a new trailer published by Eurogamer, Nostalrius admins will turn the lights back on 12:00pm Eastern / 9:00am Pacific on December 17. Blizzard Entertainment ordered Nostalrius to be shut down earlier this year. Rather than flush their codebase, the maintainers of Nostalrius handed it over to the Elysium Project, another fan-run group with the same goals: to let players return to an Azeroth untouched by expansions and patches. Elysium and Nostalrius offered a WoW frozen in time as of version 1.12, the last update prior to the launch of The Burning Crusade, the game's first expansion. Elysium ran a stress test this weekend and peaked at 100,000 concurrent players. When Nostalrius returns on December 17, it will wipe the slate clean—offering players a fresh start for both PvE and PvP. It so happens that Blizzard has considered running a vanilla server. "We explored options for developing classic servers and none could be executed without great difficulty," said WoW executive producer J. Allen Brack in a forum post following the server's closure. "If we could push a button and all of this would be created, we would. However, there are tremendous operational challenges to integrating classic servers, not to mention the ongoing support of multiple live versions for every aspect of WoW." Blizzard might have had a change of heart... or not. 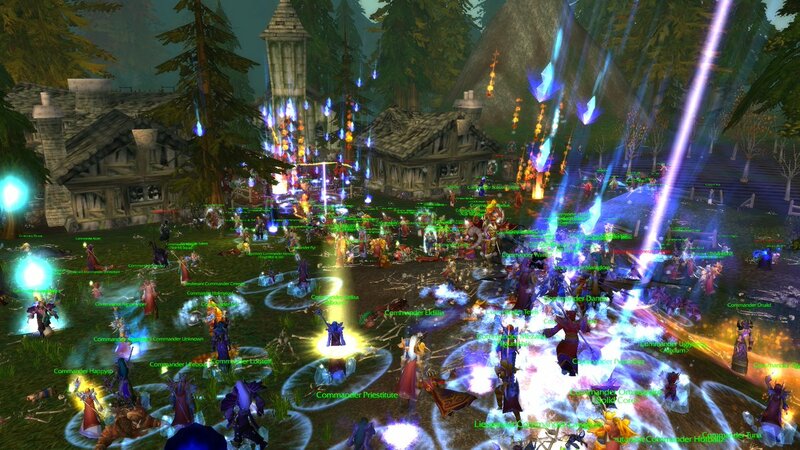 Hundreds of thousands of player signed a petition asking the company to host vanilla WoW, or let the fan-run server stay online. As a result, the Nostalrius team was invited to visit Blizzard HQ in southern California for a meeting with movers and shakers. All's been quiet on the Nostalrius front—until today's announcement of the server's imminent return. Blizzard has yet to comment on whether it's sanctioned, leading to speculation that Elysium's days could be numbered. A screenshot from this weekend's stress test, showcasing a PvP battle at Tarren Mill (courtesy of Eurogamer). Oooh that makes me want to play an enhancement shaman and destroy cloth wearers. I still want to just run through this game single-player. I don't have the time or the flexibility to get involved with an MMO any more, but I'd love to hop back in and just explore everything again. If I had my way, I could play it as a pauseable, party-based RPG, like KOTOR or Mass Effect. I'm in that boat, too. When I first heard about Nostalrius, I have to admit I just laughed it off. Revisiting the idea now, however, I'm kind of seeing the appeal to it. God I would instantly sign up again for a vanilla server. Loved the old quests. Here's the catch with vanilla servers: While you will get the code that you had 12 years ago, you won't get the free time you also had 12 years ago, so you're really going to miss some of the quality of life changes they've made over the years. Sure, but deciding to play any version, vanilla or contemporary, is a choice for how to spend free time. The stress test this weekend had over 100,000 concurrent players, and before the server was shut down this spring, it routinely had 10,000 concurrent players, which Eurogamer said is more than most Blizzard servers host for the current game. Obviously this is something people want, and it seems Blizzard might be on board with giving it to them. I still have two (opened) boxed copies of either the very original WoW on 4-5 CD's, or something shortly thereafter.